So, I know that Halloween is just a few (three!) days away, and most of you probably have all your goodies planned out already. 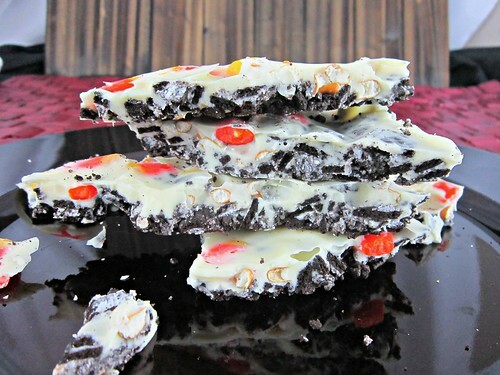 BUT, if you can squeeze in just one more, you definitely want to try this here Halloween bark. Not only is is purty, it’s insanely easy to make. Like, super duper easy peasy. There are four ingredients. And no baking or heat involved, other than melting the chocolate. How can you say no to that?? And, um, candy corn. Did I really need to say more than that to begin with? Candy. Corn. Of course there are also crushed Oreos. And pretzels. And chocolate. And did I mention candy corn? Because…yes. I don’t eat candy all that often anymore, but there are certain candies, for certain holidays that I just have to have a few of, at least. For Halloween, it’s candy corn. Somehow when I made these though, I managed to put the entire bag onto the chocolate and didn’t save even one for me to munch on. Or to use in pictures, for that matter. Oops. But that’s ok, because when I broke it apart after it had hardened in the fridge, a couple of little pieces of candy corn and cookie were left behind. And I couldn’t just leave them sitting there all sad and lonely, could I? So, of course, I ate them. Because that was the nice thing to do. And then I packaged all those delicious pieces of heaven up and today, my co-workers get to enjoy them. And hate me. Because this is the second time this week I’ve brought in sweets already. And it’s holiday season, which means there is so much more to come. They love me. And hate me. So very much. But you will only love me if you make this for your parties this weekend. Or for the kiddies. Or, just for yourself. But, maybe don’t eat it all yourself. You want to share. Because, sharing is caring!! And, if you eat it all then you might hate me afterward. And we don’t want that. So, share. Throw the Oreos in a large plastic resealable bag. All the Oreos. Trust me. Now seal it up with little to no air in there and beat the blazes out of it with a meat mallet or rolling pin until you have cookie pieces. Not all crumbs, you want some chunks in there, but not whole cookies either. 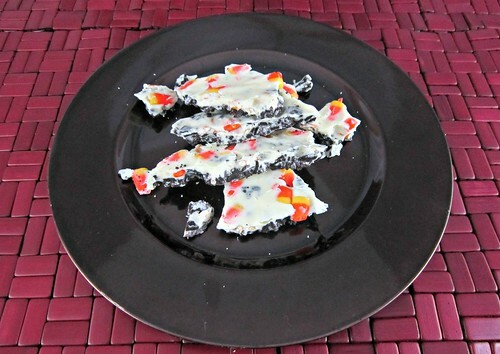 Place a sheet of wax paper on a small cookie sheet and dump the cookie pieces on it. Spread them out so the wax paper is evenly covered from end to end, then sprinkle your pretzel pieces on top of the cookie pieces. Now, melt your chocolate. Verrrrry carefully, because you do not want to burn it. You can either melt it in the microwave – I do 30 seconds at time, removing and stirring after each round, until it’s almost all melted. Then I stir until it is all melted. Or you can do it in double boiler (bowl on top of a pot of water on the stove, stir until it’s melted) but that takes longer and I don’t have the patience. Once your delicious white chocolate is perfectly melted, spoon it over the cookie and pretzel pieces. Use the back of a spoon or a spatula to carefully spread it out over the entire pan of goodies. 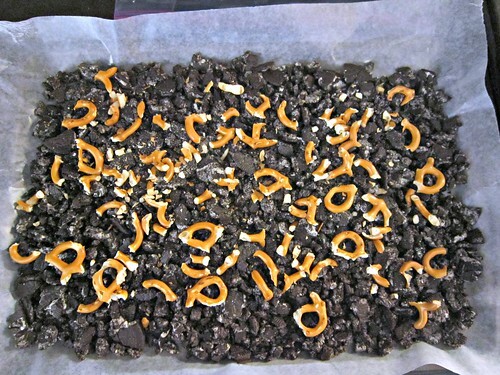 If pieces of cookie or pretzel stick to the chocolate and spoon and wind up on top, that is a-ok! Now. 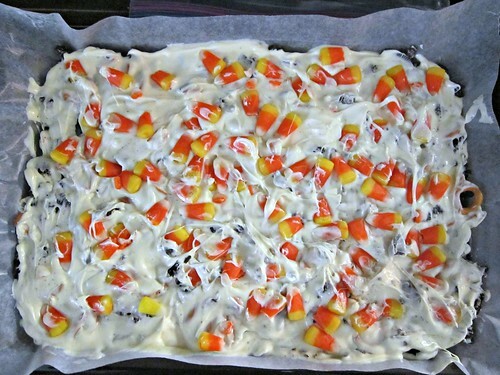 Now you sprinkle all of those candy corn lovelies on top. Then place another sheet of wax paper on top of all of it and press down to compact all of the mixture together. Leave the wax paper there and put it in the fridge for an hour or more to firm up. Once it’s firm, remove the top wax paper (it should just peel right off, with no sticking), and use your hands (or a knife if you prefer) to break the bark into pieces…big or small, however you want them. Store in an airtight container in the fridge until ready to serve. And remember to share! !